We now represent the Adam Hall Group: LD Systems loudspeakers,CAMEO Lighting, Gravity Stands,Defender cable protection, Palmer guitar & audio tools … a unique company with a lot of product choices. Shown here is the LD Maui 5. Impressive sound in a small package. A series including battery powered versions for true “go-anywhere” sound. At left is one of 3 more affordable models. This is the Journeyman, which joins the Wanderer & Passenger. At right is the Striped Ebony, with GraphTech TUSQ® nut, Hipshot Ultralite™ tuners, and a Shadow® U•Bass NFX preamp with EQ and built-in tuner. Now shipping are RCF‘s newest members of the well received EVOXfamily, the J8 & JMIX8. 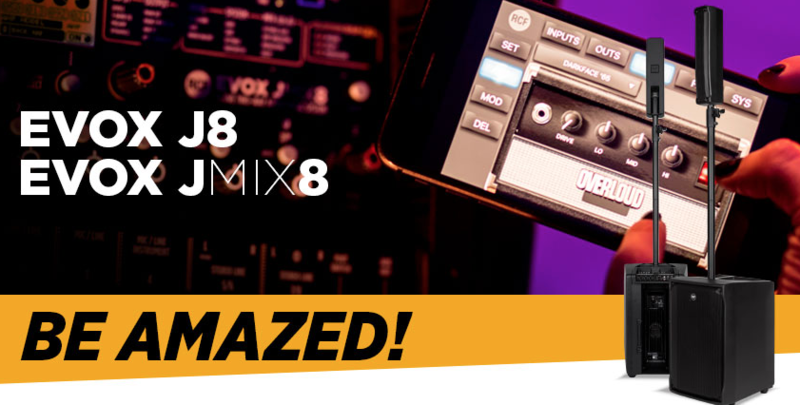 Lightweight composite construction, 12″ LF, plenty of power, and the MIX8 version has (you guessed it) an 8 ch mixer w/FX, amp simulation, bluetooth, remote iOS/Android control, everything you want & need. RCF EVOX has a model for almost any application. BIAS heads sound and feel like your favorite classic and boutique tube amplifiers, but offering entirely new flexibility. 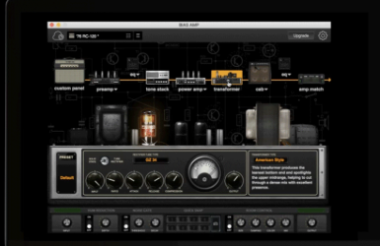 The advanced component emulation engine captures the warmth, girth and feel of real tube amps, authentically recreating the complex circuit behaviors that make them do what they do. Hard to improve on that. A real intuitive approach allows you to choose one of the classics, or create your own custom amp design. BIAS began as emulation software before creating impeccable amplifiers. Turn it up and play (btw, this technology sounds good soft as well as loud)! Your customers know about BIAS. Make sure they buy from you! Shown here are the new BIAS MINI GUITAR & BIAS MINI BASS heads. Powerful, versatile, and affordable amps that will fit in your instrument’s gig bag. $799 MAP, with sounds that will astound you. But don’t take our word for it. 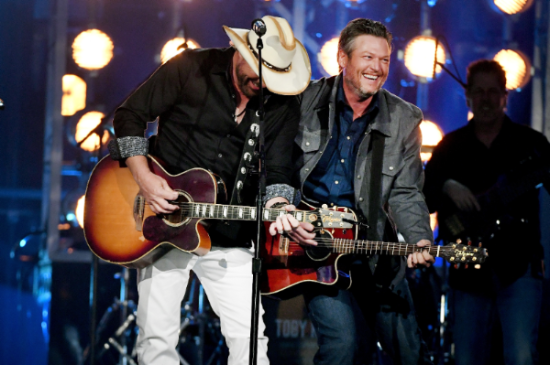 Again, turn it up and play. That’s the test of an amp. 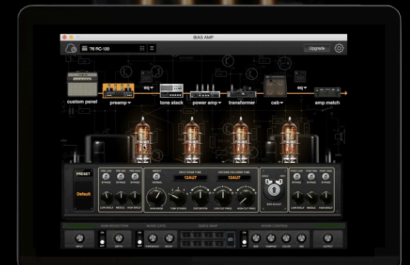 The extremely cool BIAS PRO amp designer software, normally $199 but is included with all BIAS heads. Create any existing amp or design your own. Choose your tubes, transformers, and circuit topology. Or, using their AMP MATCH, you match a tone easily. It’s quite amazing. Or how about some really cool pedals? While RCF has been quite successful selling HDL and TTL rigs, it’s important not to overlook the key ingredient in properly operating many of those systems. 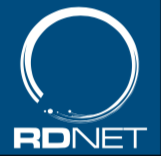 That is RDNet system management (hardware & software). Complete control, including zoning, real-time EQ (FIR & IIR), delays, air & cluster length compensation, system presets for different venues, and more. With subs, it’s easy to create cardioid, Arcs, and endfire arrays. More and more RCF loudspeakers have RDNet capability, allowing easy interface to the arrays. DiGiCo consoles are famed for their fantastic sound quality. However, a lot of mixers enjoy adding the plug-in capability of WAVES. WAVES gives an amazing array of live, low latency, audio choices, perfectly inserted into the console workflow. WAVES has gotten more and more sophisticated, not only with their plug-ins, but also their graphic renderings. That is requiring DiGiCo to move the MultiRack control off the DiGiCO screen (same audio flow). For more details contact your Quest specialist. Multiple areas, stages, venues, rooms, bands, presentations, a platform that ties them all together. Complete connectivity for complete control. 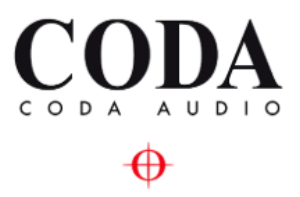 Quest is proud to be representing CODA Audio. CODA is not just another loudspeaker company. With unique technologies, such as the DDP Dual Diaphragm Planar Wave Driver, the DDC Dual Diaphragm Curved Wave Driver, along with Sensor Controlled Subwoofers, this is obviously something quite different. Based in Germany, CODA has taken a new approach to loudspeaker systems.Innovative designs have produced systems that are smaller, lighter, but with more output than conventional approaches. This is the next big thing, if you aren’t aware of them, you soon will be. There is too much to be described in a newsletter. You’ll see them at InfoComm. Some noted industry professionals are part of CODA and we’re excited. You will be too. Avolites Immersive, Ai, are the family of media servers from Avolites. At one time in concerts, there was the lighting rig and the video rig. Now, it’s a complete continuum. Every show you attend, from the latest pop star, the newest rapper, to the biggest rock band, have incredible lighting and video. What makes it work seamlessly? The best media servers, allied to the best lighting consoles. And Avolites is the only company that brings it all together. Their new Synergy actually allows users to connect and configure their Ai from the Titan interface, including a new Lightmap feature. Titan will soon be v11, Ai, v10.2. Shown here is the new Q3 media server. Joining the R4 and R8 servers, the Q3brings Ai performance to a new price point. 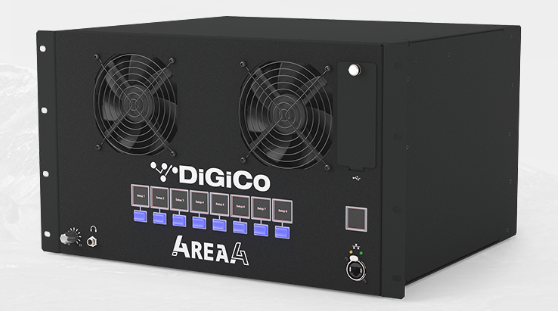 Now everybody can merge projectors, LED walls, and lights of all types, into a full show for all applications, which includes, of course, concerts, but also corporate AV and church presentations. Live and programmed video manipulation, Notch integration, 4K playback, pixel mapping & wrapping, real time generative effects, and more. This is something you need to see.